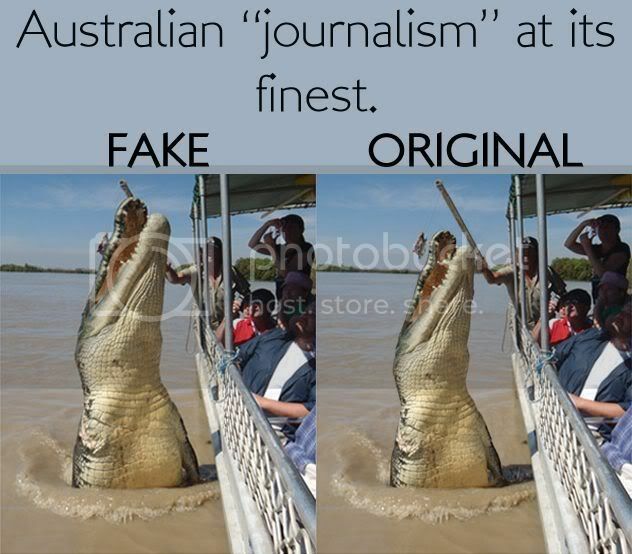 [UPDATE] See the comments section below, the NT News is claiming that the original photo is real and the "real" photo of the smaller croc has been faked! That's certainly unusual, as it's normally the larger crocodile that's the exaggeration in stories like this. But thanks guys for responding to this and clearing it up. Check out this photo and story of a monster crocodile being jumped on the Adelaide River. Impressive, yes? Well actually, it's been manipulated. Here's a comparison of the version that appeared in the NT News [left] and the actual photo [right] (thanks to Brandon Sideleau for finding this). I've got to hand it to them, it's quite a neat Photoshop job. But that's not really the point of this post. What I'd like to draw attention to is just how remarkably dangerous these jumping crocodile cruises are becoming. Don't get me wrong, I have no problem with the principle of showing tourists wild crocodile behaviour when it's done safely and responsibly, especially considering that crocodiles need all the good publicity they can get. Indeed, some of the licensed cruises who've been doing this for years have strict rules about safety. But the above photo is a fine illustration of how not to do it right, and it's certainly not an isolated incident. I've seen what happens when crocs next to boats slam their jaws sideways into the railings or gunnels. All it takes is for someone to be leaning over the edge like this photographer is doing, or simply to be resting their hand or arm on the top of the railing, and if the croc decides not to play nice then a tourist who doesn't appreciate what these animals are capable of is going to lose more than their pride. If that happens then the Adelaide River's famous jumping crocodiles will very likely become a thing of the past. Our original pic is real alright, Adam. See here: http://abclocal.go.com/wpv​i/6at4/feature?section=6at​4&id=8252604 The photo on the right has been shown to be a fake, NOT our original pic. It has since been removed from the website that first published it. Sorry, but it's you who has been had here. Ok guys, if that's true then I apologize for jumping to conclusions. I must admit it's easy to believe that a croc has been enlarged given the usual trend if exaggerating things. My hat though, has been eaten. Thanks for letting me know and clearing it up. Ahh can we see a picture of said hat being eaten ? As far as not doing it right i think 26yrs with no injuries or fatalities is pretty darn good, try and find that in some safer industries. True, but I still think more care needs to be taken to make sure you guys are still doing it for another 26 years. There have been near misses. Don't get me wrong, I'm still an advocate of these cruises, which is often the unpopular position for me to take. But I defend them because when done right (as they mostly are) they've been fantastic for crocs and the NT. But I know when the safety margin is being pushed with crocs, and that needs great care in a public context. If we met in person, I'd give you a pat on the back Dr. Adam. It is hard to distinguish what's fake and what's real these days in a world of monster crocs both real and imaginary. Quite frankly, I don't fully believe it myself that Brutus is an 18 footer.